Ratings are averaged based on 84 reviews. We enjoyed our first visit to Bali and we very pleased to stay at Breezes. It was in an ideal location close to the beach, restaurants and shops. We especially enjoyed the resort's beautiful pool, swim up bar and spa treatments. The staff were always friendly and helpful. We will definitely stay again and will recommend Breezes to our friends and family. Would stay there again the service and people were great. My family and I have stayed at the Breezes Resort and Spa many times before and it never disappoints. Great, friendly staff, wonderful atmosphere and always clean. We will be sure to return again soon. Had a wonderful time the staff were excellent very accomodating,polite,friendly and caring. The resort was great lacked nothing. Really made our holiday would definitely recommend it highly. Close to Seminyak beach and some great restaurants, the Breezes is a great place to stay. It boasts some wonderful facilities but the staff really make your stay memorable. So friendly, polite and friendly. The Superiot room in which I stayed is starting to show its age but it was cleaned well daily. Breakfast was an amazing spread with plenty of variety. Rooms very clean and surrounding gardens and pool immaculate. Enjoyed our stay at Breezes the rooms were great definately recommend the pool side room, the daily pool bar entertainment was fun and the staff were very accomodating. We have been to Bali many times and stayed in many places! The hotel was by far the best! The deal we got allowed us to stay here for 4 nights! The facilities are five star and the kids club was amazing for our 3 and 5 year old! The free golf buggy transportation to the main eat street was a great bonus too! We will be back!!! We stayed at The Breezes Resort for 10 nights and we absolutely loved it. The location is great and the staff will go above and beyond to make your stay perfect. We were a small group of friends but The Breezes would be great for families and couples. I would definitely stay here again! The staff are so friendly and the facilities clean and spacious. We went with friends and everyone said they would stay again. Very good location too, convenient and close to lots of cafes, restaurants and shopping. Spent 10 days at The Breezes and enjoyed our stay. Room are comfortable but are getting a little tired. TV's are tiny. Staff were great and accommodating. Wifi service is very poor with the system dropping out and stalling regularly. Pools were good and food ok.
We loved stopping at the Breezes. Nice room, pool area great, great choice of buffet breakfast and close to shopping, beach and a variety of restaurants nearby, We enjoyed the pool bar and especially the bingo every night. The staff were extremely helpful and anything you asked was not a problem. Thank you very much for our first time to Bali and to stay in a beautiful resort made our stay very memorable. The staff and amenities were outstanding nothing was a bother. Wow the dining area and breakfast was awesome. Also to be close enough to the beach and nearby restaurants and shopping suited us so well. In all our travels we have not come across a waiting area for late flights like your area. This was so amazing. Thank you again to all The Breezes Bali Resort and Spa. Loved staying at the Breezes, friendly staff and extremely helpful. Nothing too much trouble. Seminyak although a little out from the main shopping areas the taxi fares are reasonable to anywhere. Swim up pool bar in one pool, quiet pool for families. Rooms were large and clean, bit pricey but worth the money. Just down from the beach close to nice restaurants. Second time and was amazing. Everyone very friendly , room service perfect. Only thing which is very monor would have been nice to have more variety with Breakfast. We will definately go back. Just returned from at week in Bali and had back fabulous time. Bali Breeze's resort was great. Rooms very comfortable, nice ambience, staff very friendly and helpful. Whole package deal was affordable. I was not very impressed with our superior room on arrival. We upgraded to a junior suite and that was truly fabulous. The staff could not have been more helpful. And apart from the disappointing superior room everything else about the resort first class. Everything about The Breezes is wonderful- location, rooms, pool, facilities and the staff. Every staff member is happy, smiling, welcoming and kind. Love The Breezes. Amazing people, work so hard to keep you happy, such beautiful people. Our room a deluxe ground floor was perfect. The pools all fun and refreshing. The whole establishment was well run and organised, a very relaxing affordable get away. Amazing staff, always cleaning tidying and making sure all guests are happy, such beautiful people. Our room, a deluxe ground floor was perfect for us, modern, always clean and refreshed and close to pool. Conveniently situated in Seminyak, walking distance to beach, shops, restaurants and always transport when needed. Highly recommend loved every minute. The Breezes was a very good location for a group to stay for a wedding in another isolated location in Bali. Accommodation met the needs of the entire group and staff were great. Rooms were more than adequate and we took advantage of laundry, room service etc etc and came out more than happy with the bill at the end of our stay!!! Thank you happy people! Very friendly and polite staff. Low key place, but you were made to feel welcome. Lovely place to stay- pools are great temp, love the sand! Great for all people and families. Rooms are very nice and clean. Lovely friendly staff. Nothing too hard and always happy to accommodate every request. Clean rooms that get serviced everyday. Gardens beautifully maintained. Generally a really pleasant atmosphere around the resort that makes for a very relaxing holiday. It was one of the best hotels I've stayed in bali. Room was really good and the staff are just beautiful and very hopeful. Very clean and some nice restaurants close by. Drinks a little expensive for Bali around pool bar but. Staff were brilliant, prices at The Beaches restaurant were good, food good, drinks at the poolside quite reasonable even better during "happy hour" which went for 2 hours twice a day. Not far from the beach and there is enough shops, markets, and restaurants nearby to satisfy. We could not fault our stay at the breezes. The staff were amazing, fantastic facilities within the resort and perfect location to shops and high quality eateries. Would definite return and stay at breezes. Great resort for a family stay. Great service and the staff are always friendly and keen to help. Great place to stay, whether you are travelling alone or with a family. Staff very accommodating and the resort very clean. Breakfast is a great spread with something for everyone. The restaurant was fantastic for dinner, food delicious. 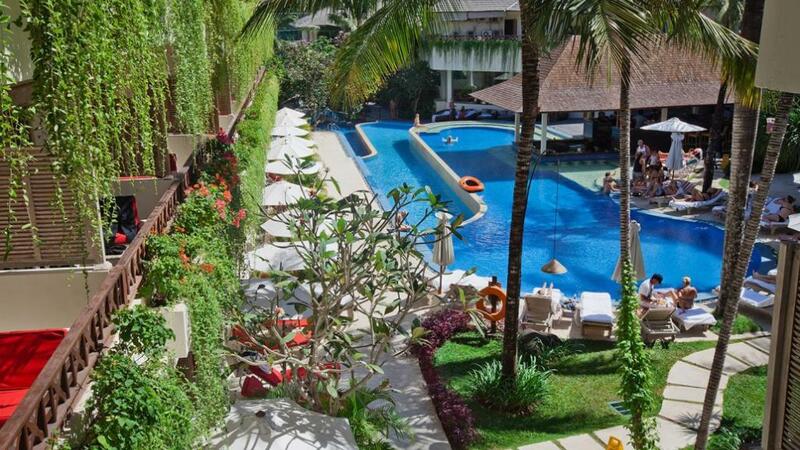 Breezes resort is close to seminyak beach, restaurants and the main shops, the staff are friendly and very helpful. Room was serviced every day, it was clean and comfortable, huge pool area and great breakfast buffet. I would definitely recommend anyone to stay there and i would definitely stay there again. Thank you to the friendly staff at the breezes resort for a pleasant experience and stay. The hotel and surrounds very clean, staff fantastic! Family of 4 stayed in 2 superior interconnecting rooms and they were perfect. Cleaning staff did an excellent job. The hotel, pool, buffet breakfast you couldn't fault. great location, close to markets & very good affordable restaurants within a few minutes walk and $2AU taxi ride to "Eat Street". The Breezes is such a great place to stay,the staff are always so lovely and no request is too much trouble,fabulous location too. Would recommend Bali Breezes to anyone. Beautiful pool areas, so clean, and the staff were amazing. Was my first ever trip overseas & we decided to stay here. They made us feel right at home and very welcome as soon as we arrived at reception. Showed us around the resort before taking us to the room & making sure we knew everything we needed to know. The buffet breakfasts every morning were absolutely amazing! I miss them now I'm back home. Biggest range of foods you can think of from juice, pastries to bacon & eggs. Absolutely hands down one of the best things of my holiday. The staff are so friendly! Cleaner is great and cleans your room every day for you and leaves you with little animals made of towels, it was so good! Defiantly will be staying here again. Great hotel in a great location. Close to shops and restaurants. Staff are very friendly and accommodating. Stayed with my teenage daughter and we had a great time. Service was excellent, facilities great. Very happy with the room. Whole place was very clean - and when help was needed for anything the staff couldn't do enough for you. Breakfast was great - plenty of food to choose from. Really enjoyed our stay at the resort and would highly recommend the resort. We really enjoyed our stay at the Breezes Bail Resort. We had a wonderful stay and would certainly recommend this place to our friends. Good breakfast, great facilities. instead of South American or Belly dancers. The Breezes was the perfect place to unwind and relax whilst still having a buzzing and vibrant atmosphere. Great staff, hotel a little dated, gardens/pools fab. Beautiful resort with exceptional staff and facilities. Our two children, aged 11 & 13 loved the resort also...and little touches such as the towel art were an added bonus. Highly recommend this resort and would go back in an instant! I have been to many hotels and resorts in Bali and The Breezes is my favourite by far. The staff are the most nicest I have ever met. The service and amenities were the best I have ever come across. Would definetley stay there next time. Good location, great staff, great room, very clean and very mosquito conscious. Service was very efficient. Prices for food and drinks were good. Lovely outdoor areas and rooms were perfect. Wonderful stay. This is our second time here and the service is great. Our kids lived he kids club. Good location for shopping and getting to restaurants. There's nothing super flash about this resort but it's very comfortable and clean and the staff are very helpful. Great breakfasts! Amazing pool, staff friendly and so helpful. Clean and tidy. We will defn return. Close to Seminyak, great pool bar, excellent food for Breakfast and dining. Staff so helpful. Happy hour music is too loud and people's behavior is loud and intrusive. We had a wonderful stay at Breezes staff were fantastic along with the facilities. We were happy with the location large supermarket & atm next door and easy short walk to beach and good shops in main street. We would definitely be happy to return to Breezes. The breezes bali has everything that most people would ever want. Very happy staff, clean room and great amenities. ..pools are very nice, although front pool with pool bar can be a little noisy. For quiet stay ask for room at rear of property. Very friendly staff without being too obvious. The games around the bar for both adults and kids was terrific to the point where staff would play table tennis or billiards with our son if he didn't have anyone else. Highly recommended. Cannot complain about a thing! Staff were lovely and our room was great - highly recommend..
had a great trip enjoyed every bit. Would recommend highly to all. Staff cannot do enough to help make your stay enjoyable. If you can book a deluxe room, do it! Easy access to the pool and great entertainment around the bar. Wouldn't stay anywhere else !! What a fantastic resort...everything was top notch, staff amazing and facilities perfect. Very noisy around the pool everyday due to lifts being installed was not the best noise of grinding constantly all day but other than that lovely hotel but would only stay on ground floor again with own day beds as a struggle to get one around the pool each day. Our second stay at The Breezes was even better than the first. We were 'welcomed back' with a fresh fruit basket and lovely personal note in our room at arrival. My daughter loved the gorgeous towel 'origami' that appeared on her bed after the room was cleaned each day. Staff were ever-smiling, ever-polite and super-efficient. The pool is especially great for those with very young children as there is a shallow part with sand. A great hotel - although not in the very 'fancy' part of seminyak, it is within easy access, close to the beach, shops and plenty of good restaurants.